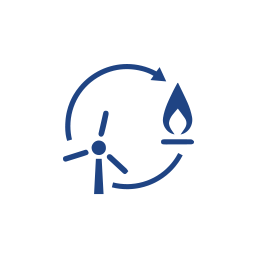 Power-to-Gas is an instrument allowing for optimisation of the overall energy system since it deals with excess of renewable electricity (compared to the demand) which is difficult to store in large quantities for a long time. Power-to-Gas means a conversion of electrical power into a gaseous energy carrier. In a first step, electricity from renewable energy sources is used in an electrolyser to split water into hydrogen and oxygen. This process is called Electrolysis. An additional Methanation step, can be used to synthesise the hydrogen with carbon dioxide into methane. For more information, take a look on ENTSO’s common position paper on Power-to-Gas from a sector coupling perspective, here. Teréga with GRTgaz developed a demonstration project for Power to Gas in Fos-sur-Mer. The aim of this initiative is to help shape this new sector by developing the technologies concerned, building the associated economic and regulatory models, and overcoming current technical reservations. Swedegas has taken the initiative to develop Power to Gas in Sweden together with representatives from the Swedish energy industry. As part of a preliminary study, the conditions for Power to Gas were examined from a Swedish perspective. We are now planning to start up a pilot plant in Sweden.